An intercepted Skype videocall, in which Kremlin political strategist Aleksandr Dugin instructs separatists of the Southeast of Ukraine, appeared on the Internet, according to the Internet edition of BY24.ORG. The video recording of the conversation between Aleksandr Dugin, Sociology professor at the MSU, who is close to the Putin administration, with the wife of Pavlo Gubarev detained by the SBU appeared on the internet on March 29, 2014 and became a hit among Ukrainian web users in less than a day. The Kremlin political analyst Dugin has reassured Kateryna Gubareva (she is temporarily acting on behalf of her husband among Donetsk separatists) about Moscow’s support. He later instructed her what further actions should be initiated by pro-Russian extremists in the Southeast of Ukraine. According to Dugin, the primary directive of Moscow is to consider all local politicians who agreed to participate in the Presidential elections of May 25, 2014 traitors. This also applies to the leaders of the Party of Regions, formerly in power. Meanwhile, Moscow still recommends to support Viktor Yanukovych, already ousted by the Party of Regions. The source reminds that even in Donetsk the recent separatist rallies demanding the return of the ousted ex-President drew rather small crowds. Meanwhile, according to Dugin, separatists should not try to find common ground with the new government in Kyiv, but to “act in a radical way.” Therefore, Aleksandr Dugin is in fact openly inciting civil war in Ukraine. At the present moment, there are no official commentaries from either Kateryna Gubareva or Aleksandr Dugin regarding the videocall published on the Internet. The Kremlin press-service does not comment on the published material, either. As a reminder, in recent years, the Kremlin has embraced the concept of a so-called “Eurasian Union,” developed by Aleksandr Dugin. Aleksandr Gelyevich Dugin was born on January 7, 1962 in Moscow. A Russian public figure, philosopher, political scientist, sociologist. His political activities are aimed at the creation of a Eurasian superpower through the integration of Russia with former Soviet republics into a new Eurasian Union (EAU). In 1979, he attended Moscow Aviation Institute (MAI), although he was expelled in his sophomore year for poor academic performance. This did not prevent him from later providing the Academic Council at Rostov State University at his thesis defense with a diploma from the correspondence department of Novocherkassk Engineering Institute (it is unknown when he graduated). In 1980, together with Geydar Dzhemal, Dugin joined the circle of the “Black Order SS,” founded and headed by Yevgeny Golovin (the so-called “Reichsführer”), one of the first Russian “new right.” Since then, Dugin considered himself a disciple of Golovin. Then in 1988, Dugin and Geydar Dzhemal joined the National Patriotic Front “Memory” of Dmitry Vasilyev, but Dugin was later expelled from the organization. According to the official statement, for “past and ongoing contacts with representatives of dissident immigrant circles of occultist and satanic beliefs, in particular, with a writer [Yuri] Mamleyev.” From 1990 to 1992, Dugin worked with the declassified KGB archives, and used those materials to publish a series of newspaper and magazine articles, books, as well as launch the “Secrets of the century” TV program that was broadcast on Channel One. Perestroika and the destruction of the Soviet Union changed Dugin’s attitude towards the Soviet regime and communism. He treats the defeat of the USSR during the “Cold War” from a geopolitical standpoint – as a victory of “sea civilization” over the “land civilization.” Dugin turns to Marxism, National Bolshevism (Nikolai Ustryalov, Ernst Niekisch), metaphysics of Communism (Nikolai Klyuev, Andrei Platonov) , Eurasianism (Nikolai Trubetzkoy, Peter Savitskiy, Nikolai Alekseev, Lev Gumilev), as well as the New Left (Guy Debord, Jean Baudrillard). In October 1993, Aleksandr Dugin defended the Supreme Soviet of Russia during the storm, and took the defeat of the parliament as a personal tragedy. Shortly thereafter, Dugin created the National Bolshevik Party [the NBP] together with Eduard Limonov and Yegor Letov which was in irreconcilable opposition to then President Boris Yeltsin. At the time, their party was known by its radical Anti-liberalism and anti-Americanism. Over the next few years, Dugin, as the ideological leader of the NBP, published a multitude of radical political and metaphysical texts distinguished by a strong poetic and metaphoric nature. His interest in the Russian Orthodoxy and the Old Believers led him to believe in the correctness of Edinoverie – the preservation and revitalization doraskolnyh [before the split of the Russian Orthodox Church]traditions of Russian Orthodoxy in the bosom of the Russian Orthodox Church. 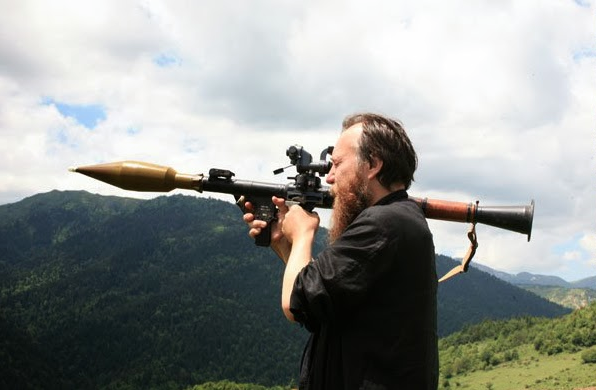 During this time, Dugin has become a parishioner at an Edinoverie parish within the Russian Orthodox Church. In spring of 1998, there was a break between Aleksandr Dugin with Limonov and the NBP. In 1998, Dugin became the advisor to Gennadiy Seleznyov, Chairman of the State Duma, and in 1999 he headed the Center for Geopolitical Expertise of the Advisory Council on National Security of the Chairman of the State Duma. Meanwhile, Aleksandr Dugin became a Geopolitics lecturer at the General Staff of Russia. 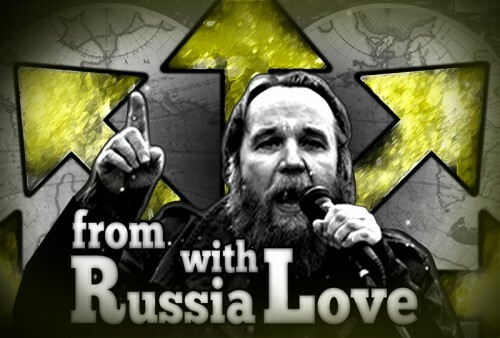 With Vladimir Putin in power, a new period of Dugin’s political activity began – he moved from the radical opposition in the previous government to being a loyalist of the current government. This entry was posted in Analytics, Crimea, English, Languages, News and tagged #CrimeaInvasion, #Євромайдан, #евромайдан, #крим, #крым, #RussiaInvadesUkraine, #SaveUkraine, #ukraineprotests, #ukrainian_revolution, #whitehouse, civil society, Constitution of Ukraine, Crimea, Dictatorship, Dugin, Kyiv, Maidan, Right-wing radicals. Bookmark the permalink. Aleksandr Dugin, Known Russian Fascist, Instructs Separatist Groups in Ukraine. Skype used in Fourth Generational Warfare for Ukrainian conflict!